The EBRD and the International Development Law Organization (IDLO) are strengthening their cooperation in judicial capacity building with the aim of boosting the investment climate in the Bank’s countries of operations. During the last decade, the two organisations have worked together on numerous projects to facilitate commercial dispute resolution in central Asia, south-eastern Europe and Arabic countries. Under a Memorandum of Understanding and a framework agreement signed today the organisations will jointly design and implement projects and have access to each other’s legal reform experts, methodologies and networks in a more efficient and cost-effective way. The EBRD Legal Transition Team will have increased access to IDLO’s experience in capacity building in dispute resolution, especially the training of judges and bailiffs. In return, IDLO will benefit from the EBRD’s knowledge of its countries’ legal and judicial systems and from the Bank’s direct contacts with governmental structures and authorities. “The agreement strengthens our partnership with the EBRD and deepens our mutual commitment to drive inclusive growth and sustainable development through the rule of law. 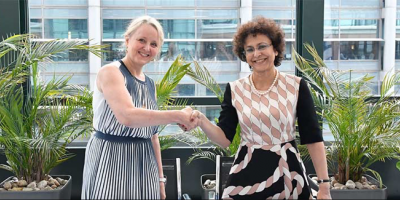 IDLO looks forward to working with the EBRD to support our partner countries to build strong and effective judicial institutions," said Irene Khan, Director-General of IDLO. In order to strengthen dispute resolution mechanisms in commercial activities the programme will include work on capacity building projects in court systems, access to court decisions and alternative dispute resolution, such as mediation or arbitration. The objective is to enhance the capacity of judges to render good-quality and legally sound judgments and of bailiffs to perform their duties and enforce judgments effectively. Facilitating access to court decisions will increase transparency, predictability and accountability. IDLO is the only intergovernmental organisation exclusively devoted to promoting the rule of law. It works to enable governments and empower people to reform laws and strengthen institutions to promote peace, justice, sustainable development and economic opportunity. The EBRD is a multinational bank supporting the development of the private sector in its countries of operations on three continents.